What Can a Chiropractor Help in Kinston? Have you ever wondered what a Kinston chiropractor can help with? This is a very popular question. Everyone thinks of a chiropractic doctor when they have back or neck pain, but not many people think of them when they are suffering from allergies, disc problems, headaches or fibromyalgia. 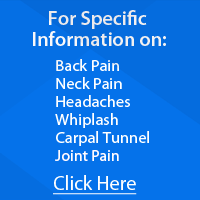 If you are suffering from these conditions call Anderson Family Chiropractic Center for a no obligation consultation. Surgery is expensive, risky, time consuming and has side effects. Majority of people heal naturally through chiropractic adjustments and you can too. Reduce your pain and improve your quality of life by giving us a call. Chiropractic is proven to help both soft tissue and structural injuries caused by whiplash. There are specific, low force manual adjustments that we perform at Anderson Family Chiropractic Center in Kinston for those that suffer from whiplash and other injuries due to a car accident. It’s very important to make sure that pressure is removed off the nerves and motion is restored. Call us today to begin your healing and put this accident behind you. Osteoarthritis occurs when the cartilage in the joints gets wore down. The likelihood of developing osteoarthritis increases if you have suffered an injury in joints like the hips, knees, wrist, hands, ankles, feet, neck or back. This condition can be very painful and make daily life a struggle. It also can have an effect on the rest of your body. This happens due to compensation. If a person has pain in one knee then they are going to put extra weight on the opposite knee. This not only effects the knee you are putting more weight on but it also effects your ankles, feet, hips, pelvis and low back. Pain killers can provide relief until it wears off and it’s time to take another pill. Chiropractic can help the pain by taking pressure off nerves and joints due to compensation. Chiropractic adjustments also help restore proper movement in joints in the affected and unaffected areas. This is important because at Anderson Family Chiropractic Center we are concerned with treating your entire body. Sacroiliac joint dysfunction is often misdiagnosed for sciatica or a herniated disc. Call Anderson Family Chiropractic Center today to be properly diagnosed. At Anderson Family Chiropractic Center we will perform a thorough exam and specific adjustments to restore movement and give you relief. It is common to experience neck or back discomfort at some point in the day. Poor posture, a life of micro traumas, toxins and much more will create subluxations within the spinal. These subluxations will lead to pain because of the compressed nerves and discs. If these aches and pains are left untreated, muscle spasms and increasing pain may occur. If left untreated for a long enough period of time, nerves can eventually die which may lead to more serious consequences. At Anderson Family Chiropractic Center, we are here to rid your body of these subluxations and relieve you pain. Headaches are considered to be a normal way of life for people today in Kinston. What people don’t know is that more than three headaches a year is not normal. There are many factors that can lead to headaches, such as loud noises, stress or hunger, but it may not be the underlying cause. The most common cause behind headaches is muscular tension in the neck and shoulders. These tight muscles can cause stress on the surrounding vertebrae which can lead to pain and headaches. Studies have found that 85% of all headaches can be traced back to the neck. A headache that originates from the neck is known as a cervicogenic headache. A person that experiences cervicogenic headaches is likely to feel throbbing, aching pain at the base of the head. The pain usually radiates into the forehead and temples with pain behind the eyes. A combination of massage and chiropractic adjustments can relieve the muscular tightness and restore structure to the neck. Regular chiropractic care can relieve and prevent headaches. Come to Anderson Family Chiropractic Center and just ask our patients! One of the most common conditions suffered by middle age to elderly citizens in Kinston is known as sciatica. Sciatica occurs when the sciatic nerve that runs through the sacrum (tailbone) and down the back of the legs. Sciatica can be caused by a misalignment or due to a muscular problem. If a person has a disc issue or experiences muscles spasms in the low back, their pain may be worse due to the increased pressure. Many people believe that their hip(s) may be the cause of this pain because of where the pain originates. The pain in the glute region is the sacroiliac joint, where the sacrum meets the pelvis. Those suffering from sciatica experience shooting, sharp, burning pains down the back of their leg. It is not very common to experience this pain in both legs simultaneously. At Anderson Family Chiropractic Center, we will properly treat this problem without surgery. We will also resolve the issue rather than mask the pain with medication. Fibromyalgia is defined as chronic, widespread pain and affects almost 6 million Americans. Today there is not a lot of knowledge as to what causes it but the symptoms include pain throughout the body, especially the joints. People suffering from fibromyalgia describe the pain as mild or severe burning, aching, sharp, shooting and radiating. Because of this widespread, chronic pain it is common for the condition to bring on headaches, depression and/or anxiety. Today there is not a known cure but research is showing that chiropractic adjustments have provided relief for those suffering from fibromyalgia. At Anderson Family Chiropractic Center we perform a thorough exam and provide care the strengths the entire body by relieving stress on the nervous system. Pinched nerves have been found to be the culprit behind many different conditions from headaches to heart attacks, from infertility to widespread pain. This happens because there are structural misalignments that compress the nerves that extend off the spinal cord. This compression not only affects the direct area but it can extend further than thought. A misalignment in the pelvis can create migraines. That is why at Anderson Family Chiropractic Center we perform a full body examination. We do not just do the minimum when your health is in our hands. Call us today at Anderson Family Chiropractic Center in Kinston for your no obligation consultation and get your body functioning at its max potential! Imagine the possibilities!